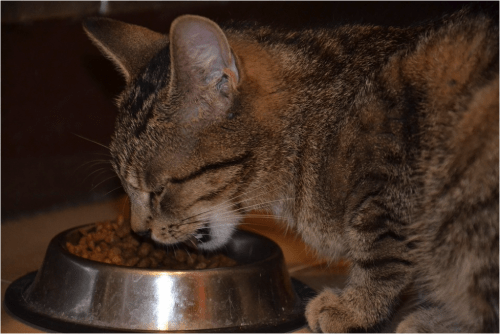 As we all know, cats can be the fussiest of eaters which is why it can be time-consuming to find the best food for cats with sensitive stomachs. What might be their favorite food one day can find them turning their nose up the next. While the switch between wet and dry, jelly and gravy, and different kinds of treats is a dance that all cat owners know well, it is of great importance to realize when your cat is suffering from something in their diet. If you’ve noticed extra vomiting or other symptoms like diarrhea, your cat may be suffering from a sensitive stomach. This article will help you understand how to recognize this, what you can do to avoid worsening their digestive problems, what kinds of food to avoid, and what the best food for cats with sensitive stomachs is. 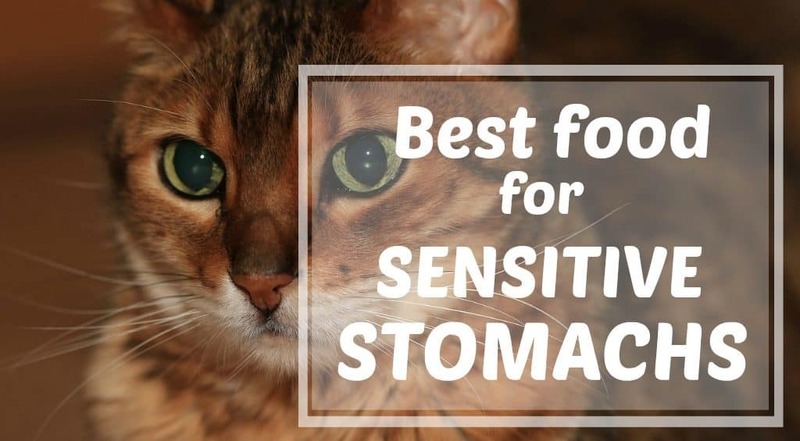 If your cat starts exhibiting signs of a sensitive stomach, and it develops into a more serious condition, you may need to buy specially balanced foods to counteract this. Until then, there are a few home ingredients you can whip up which can adequately meet their delicate needs. Typically chicken, duck or turkey are healthy options. Cook them plain and mix with a little bit of rice. These are safer long-term options than tuna. However, the best food for cats with sensitive stomachs is specially formulated food. It is available from most good stores or online sellers. 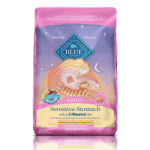 Blue Buffalo Light Protection Dry Adult Cat Food is a great dry option for cats with digestive problems. The top ingredients are real chicken and brown rice blend. It’s a high-protein, low-grain alternative to regular cat food suitable for (adult) cats with sensitive stomachs. Rather than most store-bought, ‘premium’ cat foods this one is intentionally low on grains and wheat. Wheat is a major cause of stomach problems – leading to fur-loss, vomiting, etc., in some cats. 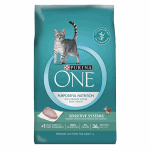 Purina One Sensitive Systems is another, similarly formulated dry cat food. While mainly consisting of real turkey, this crucially also contains a healthy amount of fatty acids, vitamins and a large dose of protein. Rather than prescription food, Purina One is a more affordable, commercial alternative. Purina One’s Sensitive Systems first ingredients are also good, with real protein at the start. Notice the difference in ingredients, though compared to Blue Buffalo. Hill’s Science Diet Sensitive Stomach & Skin is a third high-quality cat food option for cats with sensitive stomachs as it contains all necessary nutrients and vitamins to promote healthy digestion. But compared to Blue Buffalo, it doesn’t have as good of top 1-5 ingredients. Hill’s is also much more expensive than Blue, which is why Blue remains our #1 choice. Brewer’s Rice is Hill’s first ingredient, whereas real protein is in both Blue’s and Purina’s recipes. Brewers rice is a good carb for digestion, and pork meal is a neutral protein offering nutrition to felines with poultry allergies. In addition to their main meal, cats with sensitive tummies could do with supplements to help promote healthy digestion. Here we recommend 3 types of supplements you can give your cat in order to soothe a sore stomach. 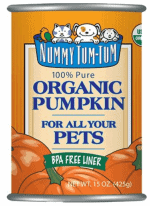 Nummy Tum-Tum offers USDA certified organic pumpkins sourced from local farms for your dog or cat. They promise only the finest pumpkins, ready to be mixed with your cat’s food or served as a topper or treat. Rich in Vitamin A and fiber, pumpkin helps promote digestive health in your cat! 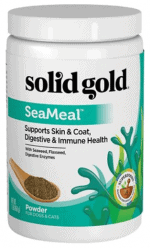 Solid Gold’s SeaMeal supplement is a great way to manage your cat’s digestive health. Simply add the powder to your cat’s food at mealtime. Tummy and skin problems in cats often appear at the same time. The powder combines a boost of digestive enzymes, antioxidants, and vitamins to ensure your cat maintains a healthy digestive system (+ immune and skin health!). VetriScience is a reputable made-by-vets brand of supplements for cats. The above chews offer an optimal blend of both probiotics and prebiotics to support digestive and immune health in cats. 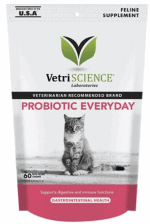 These Probiotic Chews by VetriScience are an easy way to keep your cat’s sensitive stomach in shape. If you like to reward your cat with good behavior by offering treats, then perhaps try these. We’ve purchased the Immune Health chews before when Yoda was traveling (to ensure his overall health) and he LOVED them. Sensitive stomachs might come from a medical condition that you already know about, such as an allergy, or they may be symptomatic of a new ailment that they are suffering from. In the worst case scenarios, they can be indicative of a disease in the gallbladder, pancreas, or similar organ, but they can also be brought on by heartworm. They may even be caused by parasites or other nasty things. Cats can suffer from sensitive stomachs due to normal circumstances like problems passing a hairball. In this case, a vet may recommend an oily formula to help them eject it before a serious blockage is caused . A sudden onset of vomiting or diarrhea may be brought on by something they’ve eaten in the outside world, and in which case (as long as they don’t continue eating it) are not a cause for long-term concern (unless they came into contact with a virus or bacteria from which they are not vaccinated). In younger cats, especially kittens, sensitive stomachs can even be brought on by a change in diet, so the best thing, in this case, is to maintain some dietary consistency. 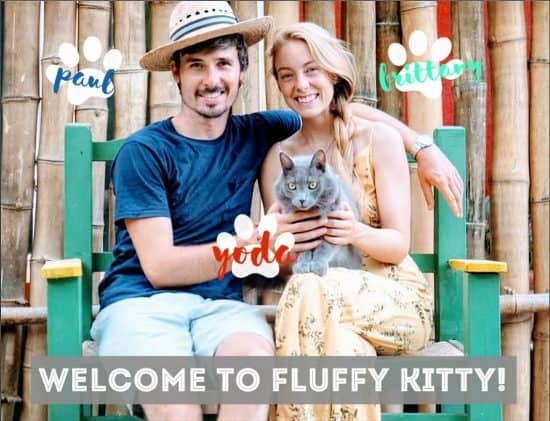 In any case, cat owners are lucky enough these days to have a plethora of options; thanks to a series of carefully scientifically-balanced, nutritious, vet-approved foods for sensitive felines. But before we dive into our in-depth review for the best food for cats with sensitive stomachs is, let’s go over the worst things you can feed them. While some cats suffer an increased intolerance to specific items of food, there is a prevailing wisdom that applies to all cats. Top of the list to avoid is pasteurized cow’s milk and other dairy products, like cream. While suitable for humans, cats cannot always digest sugary lactose . The only milk cats can drink without any risk is their mothers while they are nursing, or else they could potentially suffer from diarrhea. Most store-bought cat foods are carefully balanced for a cat’s diet, but they can still contain too many additives for those of a more sensitive disposition. If you’re looking for a temporary solution involving more natural, straightforward ingredients, consider plain cooked chicken and rice. Tuna is okay, but only in moderation, and not every day. While pungent, and typically a good, high-protein treat for your cat, this fish is high in saturated fats. And as an apex predator, tuna contains a high level of mercury. Humans even need to avoid eating in large quantities. Beef and grain have been known to cause digestive problems. Cats require more balanced and simple diets, especially if they are sensitive to such things. In the end, the best food for cats with sensitive stomachs will be simple, with no additives. It will be suitable for regular, long-term meals. It should also contain real meat products, with low (if any) traces of grains. No one likes to see their precious kitty in discomfort. A vomiting cat or one with diarrhea can be distressing, especially if it has been going on for some time. Aside from checking their full-body health, and making sure the cat’s environment has been checked for hazards that could cause the sensitivity, there are many options for dietary changes that can really affect your cat’s digestion for the better. If you’ve chosen to invest in the best food for cats with sensitive stomachs, you should always follow these guidelines or your cat’s situation may not change. And help them not to eat too quickly (as this may cause them to vomit too!). Many thanks for your comment. Paul and I are by no means professionals when it comes to cat nutrition or health, unlike a trained vet. We do have some suggestions but we would recommend to take your query to your vet! S/he will be more capable of diagnosing or at least, finding the cause to the vomiting. Blue Buffalo is a great brand of premium cat food, and they have a line for senior cats so the chews are much softer. But as older cats need highly digestible proteins, the less processed or dry food is better. So if you can serve your cats raw/semi cooked animal meat, that would be best (in our opinion – again we are not trained vets) The second best option would be dehydrated food or freeze dried. The water content is sooo much better and the quality of protein is likely to be way better, too. You could always add a little water to the food to soften it up and then fluff it up with a fork. In any case, if the vomiting persists, it’s best to see a vet as soon as possible. Thanks for your question and we hope you can find a solution! His cibble that’s what I call dry pet food haha. Thanks so much for sharing and for your comment 🙂 Yes, our feline friends often tend to scarf down their meal, leading to an upset tummy! A great way to prevent your cat from eating too fast is to place a small, upside-down bowl or cup inside the food bowl! Then pour the dry food around it or serve the wet food in small pieces (not in one chunk). Having something blocking the food from being one big heep makes it spread out, and also makes your cat try harder to get the pieces. This way they won’t be able to eat as fast. Otherwise, you could serve smaller portions at frequent intervals. Say, 1/3 of the portion, then wait 15 minutes and serve the 2/3 portion, etc. The upside-down bowl or cup inside the food bowl would be easier, and a good long term solution. 🙂 Thanks again for your question! I have an 18 week kitten with reoccurring diarrhea. In fact, I have not been able to get it under control since I rescued him. He has seen 2 Veterinarians and has had a number of tests done, all negative. I have switched his food a few times now and at the moment are trying Blue Buffalo. I have been slowly incorporating it with the last dry food we tried (Purina Beyond) for the past week and a half and it seems like his diarrhea is actually getting worse. When is it acceptable for me to switch him to another food? Also, what food should I try next? I am at a loss and desperate to put an end to this. Hi Terry, thanks for reaching out to us! The vets have examined your kitty – what food did they recommend? The fact that switching so often might be a contributing factor, but it’s strange that it’s constant/reoccurring diarrhea. 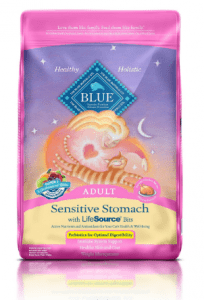 Blue Buffalo is a healthy brand of premium cat food, in fact we recommend it in our guide to cat nutrition, but the adjustment period for each food might be adding to your kitty’s upset stomach. You could try to add homemade food, such as boiled chicken mixed with rice. This is a little more consistent and can calm an upset tummy while giving your kitty lots of protein. Start by incorporating plain rice and chicken (no bones) into the food, at a warm temperature. Try to continue on a regular feeding schedule, too. This can help cats who need to have a routine. So feeding times at 8am and 6pm sharp (for example). Continue with Blue Buffalo at the moment, since it’s still the adjustment period and switching foods again wouldn’t help. In a couple weeks, when your kitten is on a regular feeding schedule with BB, rice, and chicken, see the outcome then. Remove any potential stress factors, keep him on a flea treatment, and offer lots of play time. We hope this can help, best of luck to you! My one and a half-year-old cat has been to the doctor a few times and she does not have IBD which I was hoping she did not have but she does have a sensitive stomach. She has been on the ID prescription canned food going on two weeks now and I have just started adding a canned food called Fussie Car- chicken with chicken livers , that is in a pumpkin type juice. She seems to be doing well with that but before I drop the ID canned food I want to know what you think of that wet canned food , thank you! Best of luck and thanks so much for reaching out! your article does not mention best canned cat food for cats with sensitive stomachs, my cats are vomiting and have diarrhea but mostly after eating the canned food, they seem to be ok with the dry. Thanks for your message! You’re right–we left out the best options for canned cat food! We will update our article with new information within the week, thanks for letting us know. For your kitties sensitive stomachs, what brand of canned (and dry) food do you use? We advocate to invest in brands that use only wholesome, natural ingredients. The canned food may have lots of unnecessary and unhealthy ingredients, causing your cats to have upset stomach or diarrhea. Check the proportions, too, as sometimes overfeeding (or eating too fast) can cause them to become sick. Avoid giving lots of tuna, and again check the ingredients to make sure it’s natural, unprocessed ingredients. For canned food, Muse by Purina Natural is a good choice! We will update the information in this article so check back with us soon. 🙂 Thanks Sharon!